It was on a sweltering Mumbai afternoon that I found myself walking into the basement parking lot of a building in Bandra’s Pali Hill neighbourhood. My guide, Rony Vesuna, and I were grimacing in the heat as we walked to the stuffy levels below. But the minute we turned a corner, Vesuna’s face lit up. “There she is!" he said, with a big smile. “She" was a 1957 Fiat 1100 Elegant, part of Vesuna’s collection of vintage Fiats. The car was spotless: black with white-trim wheels, dark-blue seats, a red Fiat logo on the horn button, front doors that open to the back (they’re called suicide doors) and a rounded boot hatch. Vesuna did a quick walk around the car to make sure everything was okay before starting it. I’m not much of a petrolhead but even I couldn’t help smiling at Vesuna’s infectious love. There are hundreds of Fiat fanatics like Vesuna across India. For these men and women, a Fiat is more than a car—it’s family; in fact, a “she". Some wash their Fiats with warm water in winter so that the cars don’t “feel cold", others feel physical pain when their cars get scratches. For some this love means an all-encompassing loyalty to the Fiat brand as a whole, while others are drawn to specific models like the 1100 and the cars they’ve inspired, including the Premier Padmini. As Vesuna proclaims, “I am a Fiat man." What is it about Fiats that makes their fans go weak in the knees? Why do these cars (the models from 1954-57 were colloquially called dukkar in Marathi because they resembled a pig) still turn heads on the road? In the run-up to Fiat’s 118th anniversary on 11 July, we look at what makes these cars special. Giovanni Agnelli set up Fabbrica Italiana Automobili Torino (Fiat) in Italy in July 1899. With their slant on style and design, these cars became the favoured mode of transport for many Italians. About four decades later, in 1944, Indian industrial pioneer Walchand Hirachand Doshi set up Premier Automobiles Ltd (now Premier Ltd) in Mumbai. The company initially assembled American Chrysler cars and trucks. After independence, Doshi sensed a potential market for a compact, affordable car. Premier snapped its ties with Chrysler and signed a licence with Fiat to produce a small car. The first model that was produced was the 1100, or the Millecento, in 1951-52. It was marketed as a compact family car, as opposed to the large Hindustan Ambassadors (the only other option available) which were favoured by corporate executives and government babus. “Economical to buy, economical to run and economical to maintain," was how an early Millecento ad ran. Over the next decade, new models were unveiled, like the Elegant, the Super Select and the Delight—the last being the Fiat Padmini design that is so recognizable today. These cars largely resembled the original 1100, with a few cosmetic changes such as the addition of stripes on the body and streamlined features. The wait to get one of these cars could be up to seven years. “In the 1960s, we had government restrictions on the quantity of production, which resulted in long, artificial wait-lists," says Maitreya Doshi, Walchand’s grand-nephew and the current chairman and managing director of Premier Ltd. Labour strikes and union unrests also delayed production. Maitreya’s mother, art historian and Padma Shri awardee Saryu Doshi, says buyers would often ask her father-in-law, Lalchand Hirachand Doshi (Walchand’s brother), to push their name up the list. “But my father-in-law was a staunch Gandhian and highly principled; he never agreed unless it was a truly genuine case," she said. Saryu Doshi, too, had to wait her turn for new models. Government restrictions on price and production volumes forced Premier, which started as an assembly plant, to completely localize automobile production in 1968. In the early 1970s, it ended its partnership with Fiat and, from 1973 onwards, licensed and manufactured the 1100 under its own name, calling it the Premier President. In 1975, it was rebranded the Premier Padmini after the Rajput queen of legendary beauty. This car became the staple taxi in Mumbai because it was “sasta aur tikau" (affordable and durable), as taxi drivers described it to Khushrow Mirza, who used to work at a Premier dealership in the late 1980s. “They (the taxi owners) used to tell me how the car was hardy, easy to maintain and small enough to park easily on Mumbai’s busy roads," he said. Seeing the car’s growing popularity among taxi owners and drivers, Premier started offering it to them at a discount; the government, too, lowered taxes on it. Indeed, at one point, the ubiquitous black-and-yellow Padminis, or kaali-peelis, were the only taxis available in Mumbai—in 1997, all 62,300 taxis in the city were Padminis, unlike Delhi and Kolkata, where the taxis have tended to be Ambassadors. But a 2013 government directive aimed at reducing pollution ordered cars older than 20 years off the streets. This meant that many of these Premier beauties stopped running, and are slowly being phased out. Given the Padmini’s iconic status, it isn’t surprising that people have tried to preserve the car for posterity. In 2010 and 2011, Aparna Jayakumar, a Doha-based photographer, shot a Goodbye Padmini series that documents the city’s taxis, its immigrant drivers and their tough lives. “Each driver brought out his personality in those taxis," she says. “Today’s Ubers and Olas are very dull in comparison." Her photographs were part of the 2013 Delhi Photo Festival and the 2015 Goa International Photo Festival. Designer Sanket Avlani, who runs Taxi Fabric, a design project that allows artists to transform the interiors of taxis and rickshaws in Mumbai and Delhi with funky modern art prints, chose Padminis as the first cars for his team to work on in 2015. “It’s our last-ditch effort to add something to these classic cars and make people think about them once more," says Avlani. Nostalgia and this emotional bond are the main reasons people buy old Fiats or refuse to part with the ones they own. The first car that Subhash Karmarkar, a 46-year-old management consultant in Pune, ever rode in was a Fiat. Not that he remembers the ride—when his mother’s labour pains began, she went to the hospital in a Fiat and brought baby Subhash back home in the same car. Karmarkar’s special connection with the car exists even today. It’s evident in the great care that he lavishes on his 1956 Fiat Elegant and 1961 Fiat Super Select. Vesuna, too, has a strong Fiat memory. One night, when he was about 12, he had a bad asthma attack and no medicine seemed to help. “So my parents did the only thing they could think of at that moment—they took me for a ride in the Fiat…and it worked!" Vesuna says. For Cyrus Dhabhar, a 29-year-old automobile journalist from Mumbai, Fiats are synonymous with his family. His father, Behram, was the chief test engineer for Premier, and Dhabhar grew up with these cars. One of his earliest memories—perhaps at the age of 3 or 4—is riding from Napean Sea Road to Dadar, in Mumbai, in a Premier Padmini. “I still remember that number plate and it’s the inspiration for my email addresses even today," he says. Over the years, Dhabhar and his dad, who died in 2016, used to buy and restore Fiats, setting up a “car fund" to support their passion. Occasionally, they would sell a car to a fellow Fiat fan. Dhabhar Sr. took care of the mechanical restoration, while Cyrus worked on the cosmetic reconstruction. He still does when he has the time. The sentiment on family connection is echoed by Karl Bhote, 31, who collects vintage cars and is partial to Fiats. “I got the bug from my dad," Bhote says, recalling how he grew up with his grandfather’s 1973 Premier President. Today, Bhote has an impressive collection of cars, including several Fiat 1100s. “I relate to these cars in a way that I never can with fancy vintage cars," he says. “I only saw Fiats while growing up—my family had them, my friends had them, they’re what I learnt to drive on." Owners talk about the feel of the car. Several say the car “fits like a glove". Like practised mechanics, many collectors are so tuned to their cars’ sounds that they can tell something is wrong the second they turn the engine on, they say. They regard Fiats as “solid, dependable cars" that handle well, run smoothly, and are relatively easy to maintain. I heard stories of trips made without so much as a hiccup from Pune to Srinagar and Kottayam to Mumbai in a Fiat. The Fiat design style has many fans. Farhad Bomanjee, 44, thinks his1955 Millecento has much more character than contemporary vehicles. “Today’s cars are just plastic boxes with electronics, they feel like they’ve been copy-pasted," he says. There’s also, apparently, the aura of driving a Fiat. “I can have a BMW on one side and an Audi on the other, but if I’m driving my Fiat I know everyone will be watching me," says Yogesh Acharya, a 29-year-old employee at an international bicycle company in Pune. Fiats have enough of a following to warrant the creation of Fiat clubs in several cities, including Mumbai, Pune, Hyderabad and Bengaluru—though they have been most ubiquitous in the Maharashtrian cities. The first club, named the Fiat Classic Car Club of India (FCCCI), was started by Karmarkar in Pune in December 2004. Earlier that year, a newspaper interview with Karmarkar about his passion for Fiats also gave out his telephone number. The day it was published, Fiat enthusiasts from the region were calling him to share their love for the cars and to ask about meeting up. The Pune club has had nearly 1,000 members; 50-80 members, each with a car or two, are active today. They bring out their cars on the third Sunday of every month when they meet, as well as for Republic Day and Independence Day rallies. Dhabhar and Vesuna helped set up the Mumbai club in December 2007. A little less structured, this club meets as and when time permits, though members make it a point to convene for their annual rally in December-January. It has about 50 members, who have nearly 200 cars between them. With Premier halting production of the Padmini in the early 2000s, it became hard to spot these cars on the street and the Fiats that people owned became more valuable. Initially, maintaining them wasn’t a problem because spare parts were easily available, but now the supply and quality of parts have taken a hit. Restorers like Kaizad Engineer of Mumbai’s Nicki Garage try and collect spare parts whenever possible, even if they don’t need them right away. “We have a network of suppliers but I’m starting to see that now we don’t get the same quality as before," he says. But that hasn’t killed people’s enthusiasm for restoring their cars to their former glory. Engineer, who works on about three Fiats a year, says a complete overhaul can cost up to Rs4 lakh. The lack of quality parts troubles Dhabhar, Vesuna, Mirza and others who restore their cars themselves. Some employ a little ingenuity, either fabricating the parts or using similar pieces from other cars, while the purists would rather use authentic fittings. Another problem is the dwindling number of mechanics who can fix these cars. Arvind Kirtikar, an octogenarian member of the Pune Fiat club, says many of today’s garages “only know how to replace things, not repair them". For some, Fiat is their only car and the one they use daily. For others, it’s a hobby. Whatever the case, these cars are becoming rarer by the day, and the taxis may vanish from Mumbai’s streets by December 2018. But thanks to collectors like Vesuna, Dhabhar, Karmarkar and Bhote, and restorers like Engineer and Mirza, you might still get lucky and spot a Fiat on the streets of Mumbai occasionally. As Mirza says, “If I can help keep a Fiat on the road, in whatever small way, I will be very happy." Homai Vyarawalla and her family. The former prime minister did not own a car when he assumed his post in 1964. After much pleading from his family, Shastri asked his secretary to find out how much a Fiat cost. The price was Rs12,000 but Shastri had only Rs7,000 in his bank account. He applied for a loan and bought a Fiat with the licence plate DLE 6. The prime minister died before he could repay the loan. Indira Gandhi, his successor, tried to waive it, but Shastri’s widow, Lalita, returned the loan over the next four years. Today, the car is kept at the Lal Bahadur Shastri Memorial museum in Delhi. The country’s first female photojournalist allegedly got her nickname (Dalda 13) from her Fiat licence plate. 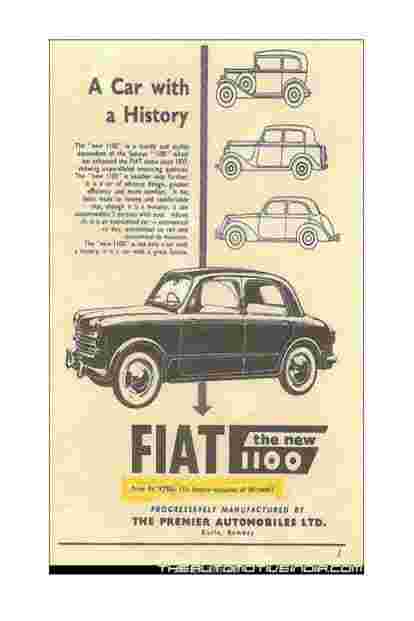 As the story goes, Vyarawalla’s Fiat 1100 was registered in Delhi in the mid-1950s as DLD 13. The number was believed to be lucky for Vyarawalla, who was born in 1913 and met her husband-to-be, Maneckshaw, when she was 13. After more than 50 years with her Fiat, Vyarawalla gave it to a family member, who passed it on to Karl Bhote. One of Bollywood’s biggest stars wasn’t sure his career would take off the way it did and thought he should have an alternative—just in case. The career, in his case, was that of a taxi driver. Dharmendra said in a 2013 Stardust interview: “It was my first car. I just had two dreams then: a flat and a Fiat car. Of course, God blessed me with a lot more. Tanuja, one of my first co-stars, owned a Herald car which had an open roof. My brother Ajit urged me to buy the same model instead of the enclosed Fiat. I told him, ‘Ajit, if our films don’t work tomorrow, I won’t leave Bombay for sure. I’ll turn this Fiat into a taxi and restart my struggle.’"